Fauré's Notre amour from his 3 Songs, Op. 23 has been arranged for viola solo and piano by the world-famous violist Donald McInnes, who held a professorship at the University of Southern California from 1985 to 2014 and is known in virtually every corner of the artistic world for his appearances with major orchestras, recitals, chamber music participation, and numerous master classes. From his later 3 Songs, Op. 23, the original poem Notre amour is by Armand Silvestre. This work is a pure and unadulterated celebration of happy, sacred & eternal love. The music is suitably exuberant with its soaring melodic lines, its rapidly moving triplet figure in the accompaniment, and its almost constant major modality. 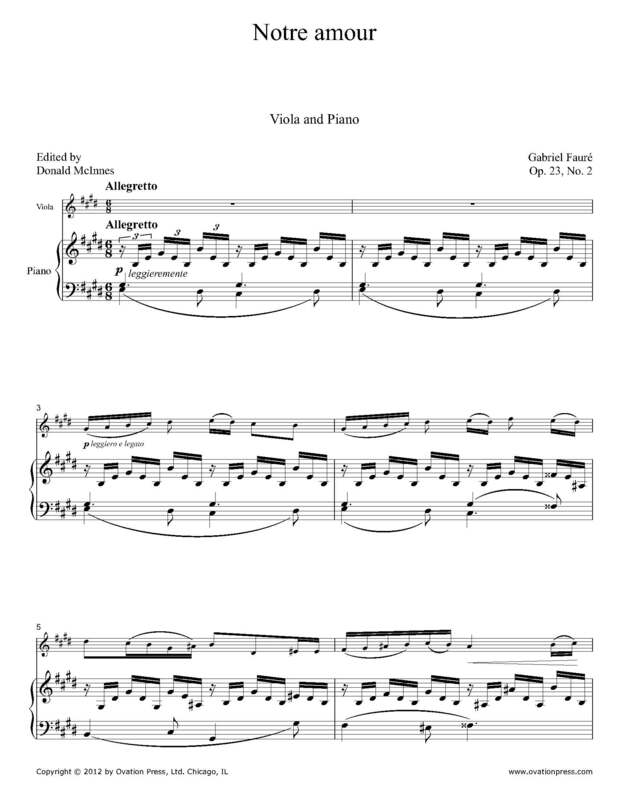 Download and print the score today to gain access to this expertly edited arrangement of Fauré's Notre amour for viola and piano by Donald McInnes! Pour qu'on les respire en rêvant. --Notre amour est chose légère. Où vibre un espoire incertain. Où les silence ont des voix. --Notre amour est chose sacrée. S'endort sous les soleils penchants. --Notre amour est chose éternelle. For us to breath while dreaming. --Our love is light and gentle. Falls asleep beneath slanting suns.